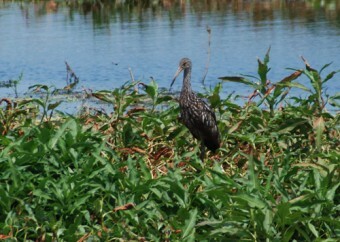 Chestnut-brown with white spots, the limpkin has a curved beak much like an ibis. It is one of Florida’s more rare birds, and has been listed on the protected species list. Its diet consists mostly of the apple snail, although it will also eat freshwater mussels, insects, small frogs, and crustaceans. Hunting of limpkins for their plumage brought the species to near-extinction in the past century, but several decades of protection from hunting helped bring back this unusual bird. It is still threatened by the draining and damming of Florida’s wetlands, since it relies on shallow wetlands for its meals. 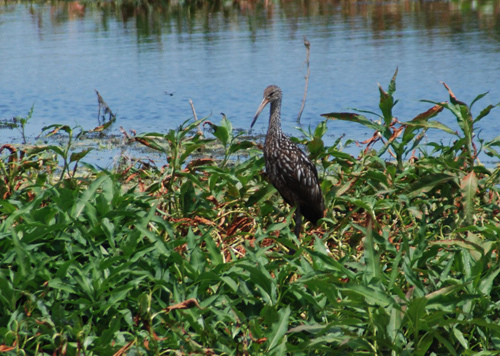 The limpkin’s cry is bloodcurlding- the first time I heard it, I thought someone was being attacked in the woods. Thank YOU Sandra,My Wife and I have been watching (and hearing) a pair doing what looks like courtship out in our back yard on a small canal (one of the St.Johns water district canals that drains into the Sebastian River. We both searched a couple of bird books and couldn’t identify.Thanks to you mystery solved.